The New Orleans Time-Picayne, the newspaper that won Pulitzer prizes for its coverage during Hurricane Katrina, and which managed to continue publishing daily during the hurricane and its recovery, announced in mid-June that it has laid off 600 people and reduced the number of days it would put out a print edition from seven to three. A hobo living on Canal Street quickly spoke up, volunteering to fill the void with blog articles and tweets about what he saw while pushing his shopping cart down the street. This, of course, would be accompanied by the requisite Facebook status updates, Instagram photos and You Tube videos taken from the mobile camera strategic mounted on his cart. The ruling on the Patient Protection and Affordable Care Act (politically nicknamed “ObamaCare”, a name most likely supported by both Democrats and Republicans depending on which way the winds of public opinion are blowing) comes out of the Supreme Court on June 28, ruling 4-3 that the Act is constitutional with a 65-page discussion. Immediately everyone on Facebook and Twitter becomes a Constitutional expert, without reading either the Act (which is over 900 pages) or the Court’s response, and turning what could be a discussion to improve the Healthcare of the country into YARIB (Yet Another Raucous and Immature Debate). When turning on the local six o’clock news, a viewer is presented with ten minutes of who shot whom, while the so-called “Arab Spring” in the Middle East, China’s first manned space docking with a space station and other important events for humanity get less than 30 seconds or no coverage at all. The Information Apocalypse is upon us (see the Introductory Article on the Thinking Man’s Guide to the End of the World, and the article on Technological Apocalypse for background). We no longer have authoritative experts, but, in their place to fill the void are a clambering mass of obnoxious bloggers (guilty! ), wildly liberal/conservative Facebook users and tweeps of all shapes, sizes, colors and questionable religious denominations. In the good old days, we had people you could trust. People like Walter Cronkite. Used to be that if you heard something from Walter Cronkite, that was it…it was gospel, law, carved in stone. I mean, the dude cried when men landed on the moon, thereby putting all of the conspiracy theorists claiming the landing was “staged” in a bad light (Cronkite wouldn’t cry if it were a staged event, right? Buzz Aldin wouldn’t punch anyone if it was a staged event, right?). Sure, before this Apocalypse, we questioned those in charge who controlled the media, claiming that they used their power to push public opinion in the way that they wanted, bending the truth to meet their own whims and needs. We’ve seen that before, with a short little guy named Hitler, a master of media manipulation (until he was bested by Winston Churchill, the best at using media blitzes that world has even seen). Now, in the world of the Information Apocalypse, we have given up that world for one where everyone and their mother (and their mothers-in-law, no doubt) has an opinion. And the confluence of the Internet and Social Media has given geniuses and idiots alike the ability to proclaim their opinions as truth, and proclaim them often. There is a balance there somewhere, but we certainly haven’t reached it. That balance lies somewhere between the few that control the media and the “everyone has an opinion” society of social networking. But in a world where Snookie can be a star, the amount of time your average blogger is willing to invest in research and fact verification gets barely over the number of seconds it takes to compose a 140 character tweet (heck, I wrote this article while driving…well, OK, my lovely wife was driving). What is the Information Apocalypse? Like the other forms of Apocalypse, it is the End of the World…this time, by over-Information. Not only are we flooded by emails, Facebook posts, instant messages and tweets…we are influenced by them, whether they are truth, BS, blatant sarcasm or truly artistic sarcasm (like this post, eh?). The amount of time the average person spends on either creating or dealing with the Information Apocalypse dwarfs the sum total of time spent on creating, researching or inventing. The flood of information chaff is surely dulling innovation. I know I get tired just typing about it. This is not a new problem. Remember, fairly recently people thought that the Earth was flat, and some people still believe in the tooth fairy. The same premises worked, just on a smaller scale. Instead of “I read it on Facebook or Twitter” it was Johnny down at the pub who was passing off opinions as facts. Vehicles like Social Media now just make it easier for Johnny, who can propagate his un-researched opinions whilst sitting in his underwear drinking a cheap Bud Light, instead of getting dressed to go to the pub for a proper draft. The combustible combination of Photoshop and Social Media has added a new twist to this age of Information propagation and disbelief in media. In the past, if it was in a photo, or caught on video, it leant a pretty good weight towards the truth (except, of course, for those afore mentioned dudes who faked the moon landing). Now, with just a bit of technical know-how, every President and Presidential candidate can be made to appear in a variety of amusing and downright nasty situations. How can you trust photos or videos? The bending of reality has some people believing that The Avengers was actually a documentary…which is not far fetched when Jersey Shore is being passed off as “reality”. Even so-called authorities such as The History Channel are avoiding well researched though sometimes boring documentaries in favor of higher rating reality shows. I love sharks as much as the next guy, but how many sharks shows should a supposed authoritative broadcasting station have (Monster Quest? Shark Wranglers? Underwater Universe?)? Let the Discovery Channel claim that space, stick to the Hatfields and McCoys! Books are not safe from the Information Apocalypse. Encyclopedias and other non-fiction books used to be the place to go for fact-finding. But the Encyclopedia Britannica stopped printing books in 2010, and its digital site has not nearly as much traffic as Wikipedia, which by definition is a policed contribution of people’s opinions; one only has to review what happens to Wikipedia during every Presidential election with the two sides constantly bending the entries to suit their needs to wonder what to trust there. Like other types of Apocalypse, the Scientists (aka “smart dudes”) have predicted this one and have tried to lay the groundwork to halt or at least slow this new Apocalypse. They have a peer review system (i.e., a dog pile) which seems to work well in most cases, but can cause camps (like the Global Warming vs. the You’re-Full-of-Crap camps, or the String Theory vs. the Get-a-Hypothesis-We-Can-Test camp). 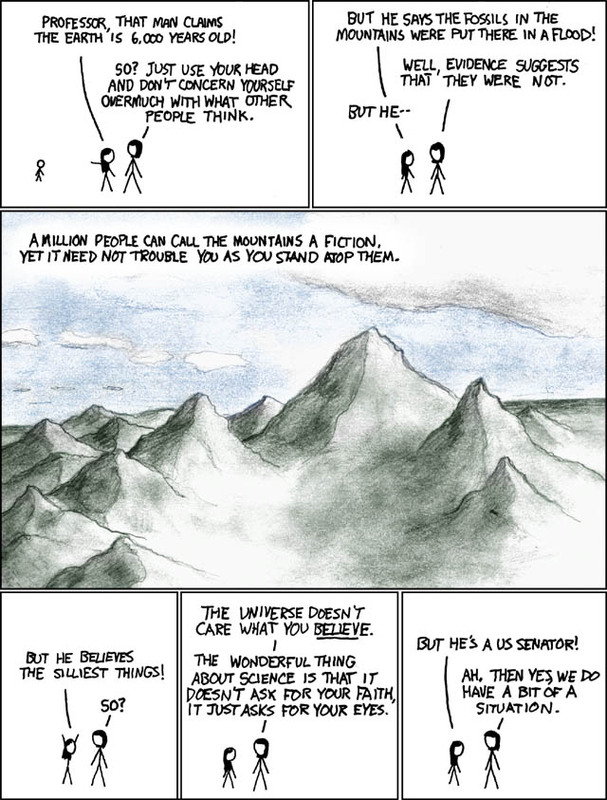 Lifehacker even did a step-by-step on “How to Determine if a Controversial Statement is Scientifically True“, which is a sad indicator that people need to be told how to think critically (I’ve borrowed the XKCD cartoon that they borrowed from XKCD). Don’t forget to think critically. So how is one to survive this Information Apocalypse? It doesn’t seem as straight-forward as surviving a Zombie Apocalypse, where shooting them in the head is the simple answer (or maybe it is the same?). In simple terms: you’ve got a brain…use it! It doesn’t take much effort, but it does seem to take a measure of discipline that lies beyond the public at large. Use your brain…before the zombies have it for an appetizer.